Family Nursing 5 Edition This popular book addresses the full practice of family nursing—identifying the family as a whole—and teaches a holistic, philosophical approach. The reader is guided through generalized concepts and theoretical foundations, reality-based applications, case studies, thorough and updated discussions, assessment, and nursing diagnoses. 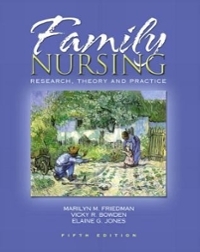 Well-organized and complete, this edition includes foundations in family theory and family nursing—essential in preparing a comprehensive family nursing assessment and planning appropriate interventions. A four-part organization covers introductory concepts, theoretical foundations of family nursing, family nursing practice, and cultural diversity among families. For pediatric nurses, nurse practitioners, family counselors, clinical nurse specialists, and anyone planning for a career in family or community cursing.